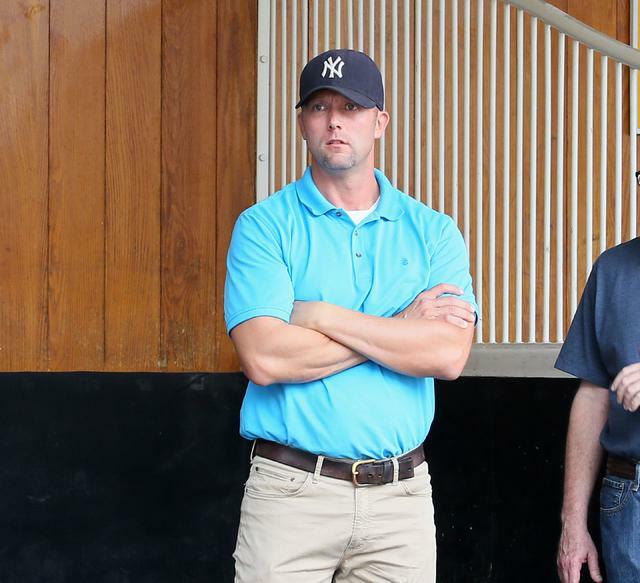 Jeff Hiles, a former U.S. Marine and longtime assistant to trainer Kenny McPeek, is set to start the next chapter in his life by stepping out on his own and becoming a trainer. Hiles, 38, has experienced many facets of life including serving five years in the Marines and eventually earning his way to becoming McPeek’s assistant after working his way up from a groom and hot walker. Hiles has experienced the true tragedies this sport can be faced with after he was one of the first people on scene when his exercise rider, Odanis Acuna, passed away Saturday. “It’s been a really tough few days,” Hiles said. “There were times over the last couple of days when I thought to myself if I really wanted to do this anymore. Then, after a couple of failed attempts at claiming a horse, my owner (Mickey Bailew) finally got one on Sunday (Say It Softly in Race 10) and I felt reenergized. I still had that thought on Monday morning when I woke up but when I got back to the barn and saw her in the stall, I knew this is what I wanted to do. CLARK HANDICAP FIELD TAKING SHAPE – The field for the premier race of the Fall Meet, the $500,000 Clark Handicap presented by Norton Healthcare (Grade I), is beginning to take shape. The following horses are probable to enter the 1 1/8-mile test on Friday, Nov. 23, according to Churchill Downs Assistant Racing Secretary and Stakes Coordinator Dan Bork: Believe in Royalty (trainer Larry Jones); Bravazo (D. Wayne Lukas); Hawaakom (Wes Hawley); Hence (Steve Asmussen); Leofric (Brad Cox); Prime Attraction (James Cassidy); and Seeking the Soul (Dallas Stewart). Weight assignments will be announced Saturday. The Clark Handicap is the centerpiece of six graded stakes races that take place on Thanksgiving Weekend cumulatively worth $1.4 million in purses. Other stakes races that week are: the $200,000 Falls City Handicap (GII) for fillies and mares at 1 1/8 miles on Nov. 22; $100,000 Cardinal Handicap (GIII) for fillies and mares at 1 1/8 miles on turf on Nov. 22; $200,000 Mrs. Revere (GII) for 3-year-old fillies at 1 1/16 miles on turf on Nov. 23; $200,000 Kentucky Jockey Club (GII) for 2-year-olds at 1 1/16 miles on Nov. 24; and $200,000 Golden Rod (GII) for 2-year-old fillies at 1 1/16 miles on Nov. 24. THIS WEEK AT CHURCHILL DOWNS – Only two weeks or 10 days remain in the 21-day Fall Meet at Churchill Downs and racing continued Wednesday for a five-day week beneath the historic Twin Spires with a first post of 1 p.m. (all times Eastern). Entries were taken Wednesday for Saturday’s featured race, the $100,000 River City Handicap (Grade III) for 3-year-olds and up at 1 1/8 miles on turf that was expected to feature multiple graded stakes winner Mr. Misunderstood for trainer Brad Cox. Multiple graded stakes winner Streamline was installed as the 5-2 second choice on Mike Battaglia’s morning line odds as she faces five rivals in a conditioned allowance race on the turf Thursday. Jockey Chris Landeros, who won three races on Sunday’s program, has the call. G. Watts Humphrey Jr.’s homebred Net is set to make her debut in Race 7 on Thursday for trainer Rusty Arnold II. The 2-year-old filly by Curlin is out of Humphrey’s four-time winning stakes mare Let, who most notably won the Churchill Downs Distaff Handicap (GII) (now known as the Humana Distaff) in 1999. Net is the half-sister to former Mrs. Revere Stakes (GII) winner Centre Court, who also was trained by Arnold. The final episode of the 2018 season of “Inside Churchill Downs” is set to air Friday at 6 p.m. on ESPN 680/105.7. The one-hour horse racing radio show features prominent trainers, jockeys and insider handicappers. Listen live at www.espnlouisville.com. MEET LEADERS – Jockey Brian Hernandez Jr. began the week with a 9-8 win lead in the jockey standings over Edgar Morales and Ricardo Santana Jr. Jockeys Tyler Gaffalione and Florent Geroux were tied for fourth with seven wins. … Trainer Dallas Stewart had a slim 5-4 win margin over Steve Asmussen, Brad Cox, Kenny McPeek, Bill Mott and Ian Wilkes. … Loooch Racing Stables held a 4-3 win lead over G M B Racing and Juddmonte Farms in the owner’s standings. MILESTONE WATCH – Trainer Dale Romans was five wins away from 2,000 career victories. The South Louisville native began the week with 1,995 victories and had two entries Wednesday and one Thursday.